Demand for the heavy weapons made there has fallen as the U.S. scales back forces in two wars. SACO – General Dynamics said Thursday that it plans to lay off 110 employees in Saco, about one-third of its work force, because of reduced demand for heavy machine guns as the U.S. military downsizes operations in Afghanistan and Iraq. The company warned workers that they would be laid off in the period from June 14 to July 1. The group includes salaried and hourly-wage employees who were involved in the production of heavy machine guns and auto-grenade launchers. No other General Dynamics Armament and Technical Products facilities will lay off workers. 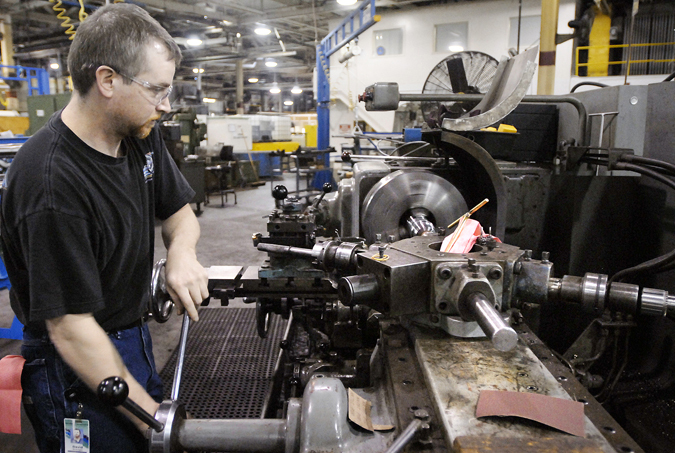 The unit employs nearly 2,700 nationally. The facility in Saco, which laid off 30 workers last fall, makes large, heavy weapons that are operated by two or more people. The average wage for union workers at the plant is about $20 an hour, said Ethan Snow, spokesman for the New England Joint Board for Unite Here, the union representing most of the workers. The company would not comment on wages. No additional layoffs are expected at the plant in Saco, though General Dynamics said it continuously evaluates its business. Earlier this year, the plant was awarded a $14.3 million contract extension for specialized machine-gun barrel kits being made for the Army. In addition to the 110 employees to be laid off, 15 will be offered voluntary separation packages, Johnson said. After all the cuts, 215 workers will remain. Johnston said General Dynamics, Saco’s largest employer, knew for several months that it would have to cut jobs. Snow said the workers had heard rumors about pending cuts for months. The union plans to help laid-off workers file for unemployment. Pingree’s husband, S. Donald Sussman, is the majority share owner of MaineToday Media Inc., which publishes the Portland Press Herald. In January, the Saco City Council voted to forgive General Dynamics as much as $100,000 in property taxes over the next six years in a tax increment financing package that would allow the company to move forward with an expansion plan. At the time, General Dynamics planned to build a 3,000-square-foot addition for an estimated $750,000. The expansion was expected to add a product line and support at least 12 jobs. General Dynamics did not return calls Thursday regarding the TIF or the status of the expansion.